^ "Happy Dashain 2075". Lumbini Media. September 18, 2017. Retrieved 2017-09-18. ^ "Mahishasur Mardini". Shaktisadhana.50megs.com. Retrieved 2015-11-11. ^ "The Slayer Of Mahishasura". Balagokulam.org. Retrieved 2015-11-11. ^ nmn (28 September 2011). "Dashain begins with Ghatasthapana Wednesday". Nepal Mountain News. Retrieved 2015-11-11. ^ "Dashain 2072: When is Dashain in 2015 (2072) : Dashain 2072". Sanjan Media. September 25, 2015. Retrieved 2015-11-11. 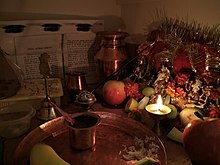 ^ "Ghatasthapana". Riiti.com. Retrieved 2015-11-11. ^ "Ghatasthapana for luck and prosperity: Dashain days are here again". My Republica. Retrieved 2017-09-24. ^ "Fulpati". Kathmandu Post. Retrieved 2015-11-11. ^ a b "Days of Dashain". Nepalvista.com. Retrieved 2015-11-11. ^ "September Festivals". Explore Himalaya. September 27, 2009. ^ a b c "ECS Dasain". ECS.com.np. Retrieved 2015-11-11. ^ "To Swing On A Ping". ECS.com.np. Retrieved 2015-11-11. ^ "ENJOY HEALTHY FOOD THIS DASHAIN". My Republica. Retrieved 2017-09-24. ^ "Goat for Dashain - The Himalayan Times". The Himalayan Times. 2017-09-21. Retrieved 2017-09-24. ^ Criveller, Gianni. "NEPAL Buddhists and animal rights activists against animal slaughter for Durga - Asia News". Asianews.it. Retrieved 2015-11-11. ^ Bibek Bhandari. "Animal rights activists want Nepal's sacrifice festival stopped | South China Morning Post". Scmp.com. Retrieved 2015-11-11. ^ "Dashain festival, Nepal - Occupy for Animals!". Occupyforanimals.net. Retrieved 2015-11-11. ^ "Debating Animal Cruelty During Nepal's Dashain Festival · Global Voices". Globalvoices.org. 2010-10-21. Retrieved 2015-11-11. ^ "NFC starts selling goats for Dashain". My Republica. Retrieved 2017-09-24.